Col de la Croix Fry is one of my favourite late-winter climbs. The moment there are a few consecutive sunny days (so the roads are dry), I start planning a visit. Basically, a beautiful Alps ride, while the higher stuff is still closed. This ride (map below) is a relatively challenging 80 kilometre loop (1850 metres ascent) that also includes the super-scenic Col des Aravis, Gorges de l’Arly, the Annecy Bike Path, and Col du Marais. As usual, I stopped at my favourite hairpin for some photos (3 kilometres below the Croix Fry summit). For a great, more challenging, version of Col de la Croix Fry, you can climb Col de Plan Bois first, rejoining Croix Fry for the best, upper half. See here. It’s a fun descent of the south side of Aravis to Flumet, then the route turns down onto the D1212 and into the Gorges de l’Arly. Note, this can have a touch of traffic (it links Annecy/Albertville with Chamonix). Thus, I highly recommend my route where I soon turned up onto the D109. This adds some climbing but it’s a fun cliff route towards Ugine. It’s a 10 kilometre descent into Ugine on some great hairpins. Then the route crosses the main road and briefly joins the Annecy Bike Path. Finally, a short descent back to the start. Note, an interesting and slightly harder alternative would be to reach Col du Marais via Col de l’Epine – which also starts from the Annecy bike path from Marlens – see here. I love this loop. A beautiful Alpine challenge while the higher stuff is still closed. Matt, yes, personally I think more fun clockwise – mainly as I think Croix Fry is beautiful from this side in winter and I prefer getting through the Gorges stretch quickly. It snowed over night. 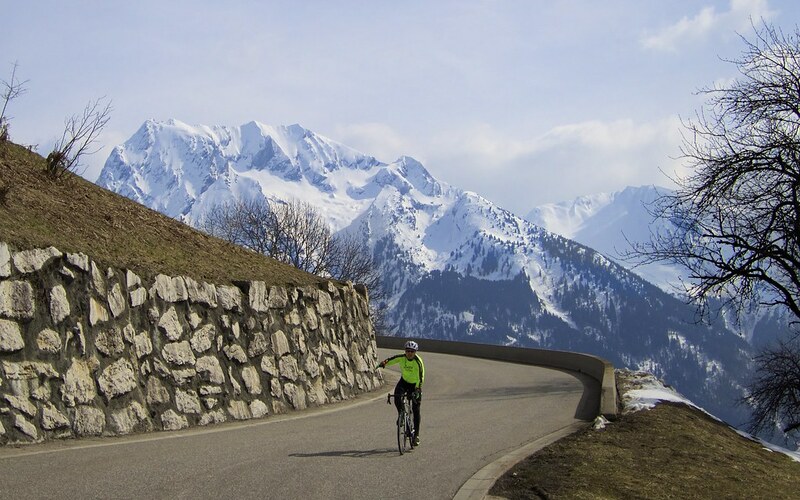 Just be careful on the descent stretches in the shade on Croix Fry and Aravis – can be some wet patches that may be icy – especially early in day. You managed Joux Plane on the north side? Excellent. Thanks for the tips! Clockwise it is, and will avoid Col de Plan Bois. No, strictly south side of Joux Plane. Rode it in a cloud all the way up last year, but this time the weather was clear and the views took my breath away. Well, whatever breath I still had! You claim to ride up mountains slowly, but you’re still much faster than me!! Matt, just to add: If you are on road bike, I think it would be prudent to NOT do the Col de Plan Bois extension to Croix Fry that I often visit. It may still be closed on top of east side (easily walkable in deep snow with mountain bike) – but more importantly, the descent gets no sun in many places and is often very slippery, especially if recent snow. I too am always searching for ways to keep my fingers warm. Every tried a second very light pair of gloves inside bigger ones? To answer your question, I don’t think it makes a huge deal, but the opposite way that I rode, counter clock-wise, would be your answer. Because the Aravis south side is a little shady, while north side is exposed. And most importantly, the entire west side of Croix Fry is in the sun, versus the quite chilly short east side that I descended. Although descending Marais might be a touch chilly. Enjoy. Thanks very much Will. Can’t wait to try it 🙂 Yes I have tried multi layer gloves, a latex one under winter wind proof gloves gets me closest to comfort! Superb. I think the 100km Croix Fry, Marais, Epine, Arpettaz, Aravis circular is one of the finest rides in the Alps when done from St Jean. Discovered it all from your website in 2009. Many thanks. Nick, that is indeed a great route. Arpettaz is terrific. This is a nice video and soundtrack someone made of the route in 2011. Enjoy! I just wondered – given most high Alpine routes are still closed right now and are for most of the year, what is it you do yourself in terms of winter riding? And can you suggest or recommend routes or rides that are indeed safe and accessible when the weather turns cold? In recent years I’ve done a bit more Cross Country skiing in place of cycling in winter. A fun hobby is to mountain bike up to trails and rent CC skis (I have a few blog posts here doing that). 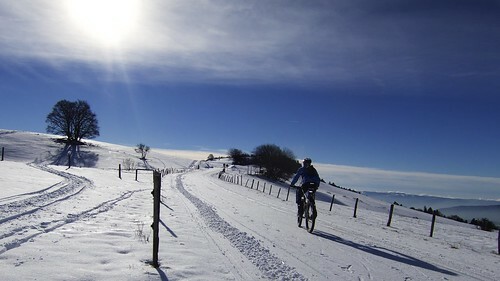 I do a lot of winter mountain biking from home too – with the occasional snow traverse of Mont Salève. Recommend routes? Ski stations are the best bet for winter climbing as the roads are well maintained and kept open. Also wise to wait for a few consecutive days of sun, so highest roads aren’t icy. Near me, the highest pass open all year is Col de Pierre Carrée – Flaine ski station. It’s a great climb that I often do in late winter. One needs to dress well and be sensible on descents, remembering that shaded or north facing climbs can have ice at far lower levels than south facing roads. For example, in the post above, the Aravis and Croix Fry photos were taken at similar altitudes but Croix Fry gets far more sun. 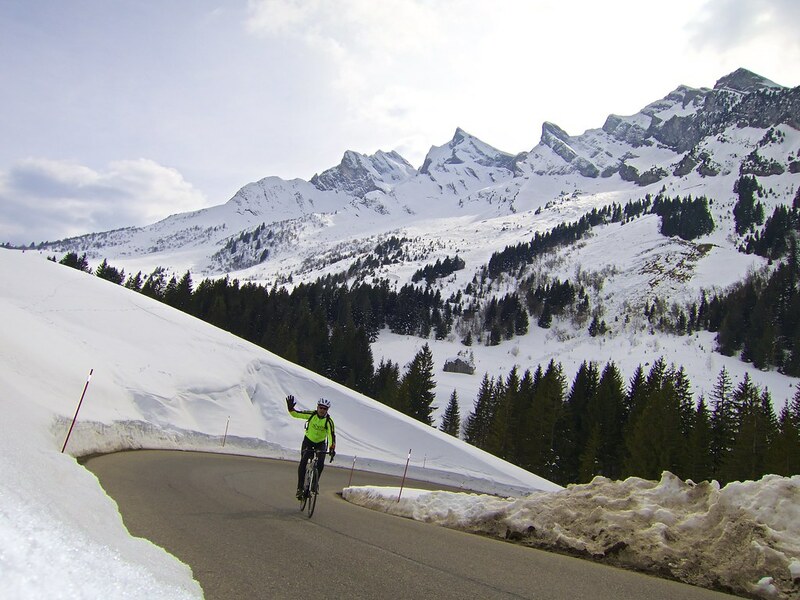 Favourite winter climbs near me: Pierre Carrée, Plateau des Glières, Aravis / Croix Fry, Le Semnoz, Mont Salève. 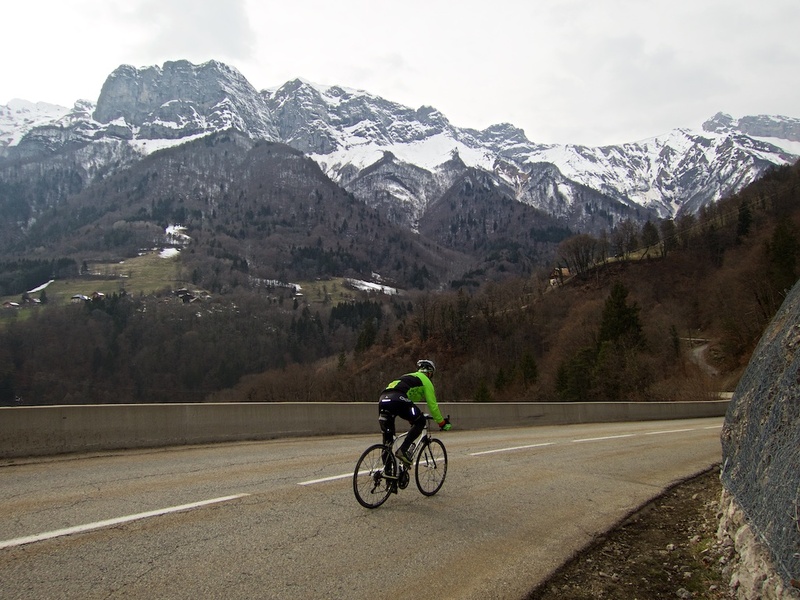 I also often just avoid the road bike for a few months unless riding down low in the Genevois – instead using a mountain bike. That is a great route — if I’m not mistaken you nowhave to take the high road into Ugine because the main route through the valley is closed. 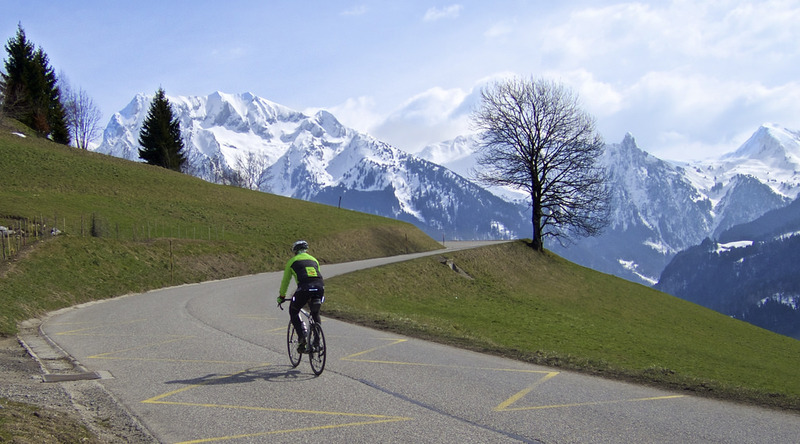 (or at least it was a month ago) The descent from Aravis is wonderful. By the way, in that area, looking forward to Saisies in the TdF.